WASHINGTON, D.C. - (The U.S. Consumer Product Safety Commission, in cooperation with the firm named below, today announced voluntary recalls of the following consumer product. Consumers should stop using recalled products immediately unless otherwise instructed. Retailer: J.C. Penney Corporation, of Plano, Texas. Hazard: The heat-sealed patches on the front of the garment can detach, posing a possible choking hazard to young children. Incidents/Injuries: There has been one report of a patch detaching. No injuries reported. 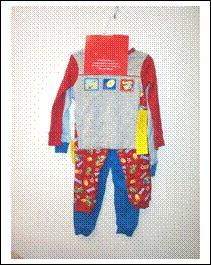 Description: The recalled pajama shirts are heather grey with red or blue sleeves with heat-sealed alligator and football patches on the front. The collar tag reads “Okie Dokie.” The pajama pants are red or blue with cartoon pictures of alligators, footballs, and stars, and the word “football.” They were sold in infant sizes 12M to 24M and toddler sizes 2T to 5T. This recall does not include the pajama sets with the alligator and football silk-screen images on the pajama shirts. Sold at: J.C. Penney stores nationwide from June 2004 through September 2004 for about $22. Remedy: Consumers should immediately stop using the pajama sets and return them to the store where purchased for a refund. Consumer Contact: For additional information, contact the J.C. Penney Customer Service Department toll-free at (888) 333-6063 anytime or visit the company’s Web site at www.jcpenney.com.